Have you ever looked at a concrete sidewalk, porch or driveway and thought; it looks beautiful with the exception of that unsightly crack? We know that concrete cracks, but planning for those cracks can minimize your chances of getting one in your next project. There are several reasons why concrete cracks, with the most common being drying shrinkage. Concrete, when placed in the plastic state, is at its largest volume. As the concrete sets and hardens, it begins to shrink. On average, concrete shrinks 1/8 inch in twenty feet. Concrete is typically designed for compressive strength and has significantly lower tensile strength. 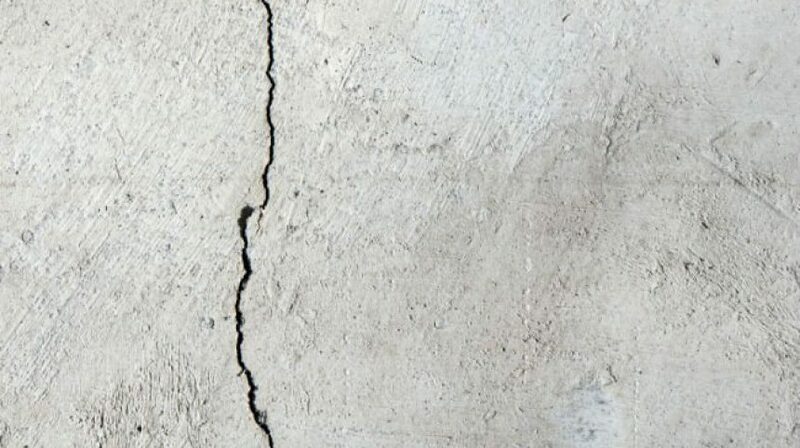 If the internal tensile stresses are greater than the tensile strength of the concrete, a crack can develop. Excess water in the concrete mix can also increase the probability of cracking. When placing the concrete, avoid adding extra water to the mix. The excess water will evaporate from the concrete which will lead to increased shrinkage. Make sure that you choose the proper concrete mix for your project. Sub-grade preparation is critical in providing a good base for your new concrete. The sub-grade should be smooth, uniform, have positive drainage and be free from frost. Without proper support, the concrete can settle and crack. A smooth sub-grade will reduce any restraint as the concrete shrinks thereby reducing the chances of cracking. Proper curing of the concrete is also crucial to help prevent early age cracking. Curing is the act of helping maintain concrete moisture by preventing its rapid loss. If the concrete loses moisture from its surface too quickly it will shrink (faster than the concrete below the surface) causing a condition referred to as map cracking. This condition is typically cosmetic and does not affect the structural integrity of the concrete. In some cases lack of curing can lead to more severe cracking that can require repair. Actively curing the concrete is always a recommended practice that improves the overall integrity of the concrete and further helps to prevent other surface defects such as scaling. Because concrete will crack randomly, we attempt to control where it will crack by incorporating contraction joints. Joints are easy to maintain and much less objectionable than a random crack. Contraction joints may be formed with plastic or hardboard preformed strips, saw cuts or tooled in the plastic concrete. The placement and depth of these joints is critical for effective performance in preventing random cracking. Use the following chart to help determine where the joints should be placed based on the slab thickness. The maximum joint spacing is 18 feet. Also, keep in mind that the length to width ratio of the joint patterns should not exceed 1.5. It is best to keep the “panels” as close to square as possible. Construction joints need to be 1/4 the thickness of the concrete slab. By jointing the concrete, you are trying to create a plane of weakness. This plane of weakness should dictate where the concrete will crack. If using a hand tool to joint the concrete, make sure that the edge is not worn and will provide the full depth necessary. Concrete should be jointed as soon as possible. The advantage of using a plastic or hardboard preformed strip is that it is placed in the concrete while the concrete is still plastic. It is important to make sure these strips are aligned properly and not skewed. If not placed properly, a random crack can occur. Hand tooling joints is another effective method of jointing but is not always practical. When using a hand tool, you should tool the joints with each successive pass of finishing. If using a saw to cut the joints, the cuts should be made as soon as the concrete can withstand the sawing without raveling the edges of the saw cut. Understand that the longer you wait to cut the joints, the greater the potential for cracking. If a crack develops before the concrete is sawed, the sawed joint will be ineffective. Typically, concrete should be saw cut within the first 6 to 18 hours. Do not wait longer than 24 hours. If using an early entry saw, cutting may be possible within a few hours of placement. Research has shown that the timing of the saw cut is more important than the actual depth of the cut. Although shallower depth may be utilized, industry standards still recommend cutting to a depth of 1/4 the thickness of the slab. There are several methods for moist curing, but the most common are continuous spraying/fogging or a wet covering. Spraying/fogging can be achieved with an ordinary lawn sprinkler if good coverage is provided and water run-off is not a concern. Soil-soaker hoses also provide excellent curing. If you choose a moisture-retaining fabric, burlap or cotton mats are recommended. They should be placed on the concrete as soon as it has sufficiently hardened in order to prevent surface damage. The coverings should be kept continuously moist and a film of water should remain on the concrete surface throughout the curing period. While it is not always necessary to seal joints, this can help protect the joints from the infiltration of surface water and incompressible materials into the joint. Surface water infiltration can lead to sub-grade failure and incompressible materials in the joint may contribute to spalling. Any sealant application should be delayed to ensure the shrinkage of the concrete is complete. Sealant materials should bond to the concrete, be impermeable, and be able to handle expansion and contraction.